Home Agriculture The rains are coming, but will cloud seeding work? It sounds like the stuff of cartoon supervillains, but weather modification techniques – like cloud seeding – could be a powerful tool as the planet warms and droughts worsen. Seeding clouds aims to squeeze more precipitation out of them, boosting rainfall in dry areas and adding to the snowpack that feeds streams and rivers winding down from mountains. It is a product of World War II-era scientific utopianism resurrected to head off climate change-era dystopias, and it could be a last-ditch effort to halt global warming itself. Water managers from Australia to Israel to the American West to Zimbabwe are investing millions of dollars into the technique, with China – which has a considerable need for it – leading the way, investing $168m in it recently. On the other hand, Zimbabwe, one of the 56 countries in the world that regularly cloud-seed, put aside $400 000 this year towards it. But like cartoon supervillains, no one knows for sure that the tech works, because despite its long history and the fairly basic principles behind it, proving the technology’s efficacy is a devilishly difficult science experiment. But don’t tell that to the Zimbabwean authorities. According to Linia Mashawi, the senior forecaster of the Meteorological Services Department (MSD), in Zimbabwe cloud seeding on average starts in late November or December. “It is variable as the start of the rainfall season is variable from one season to the next,” Mashawi explains. The 2018-19 rainy season is expected to start from tomorrow (Friday), with heavier falls in the southern provinces. But the MSD says the 2018-19 season will see erratic rains overall, which calls for cloud seeding to begin in earnest to enhance the chances of rain during the season. Zimbabwe uses aircraft hired from the private sector to do the job as the MSD does not have its own aircraft. Cloud seeding is supposed to wring more precipitation out of a cloud using water vapour that is already floating in the air, waiting to fall.Some types of clouds are full of “supercool” water vapour – which means the droplets are colder than 0°C, but they have not frozen yet. Although your science teacher might have glossed over this, water does not automatically freeze when it hits the freezing point. It takes some doing to get free-flowing liquid water molecules to arrange themselves into the orderly crystals that form ice. Once the water gets cold enough, it needs a seed to kick things off. A seed can be almost anything – a fleck of ice, a dust particle, or even some species of bacteria. Cloud seeding generally uses silver iodide, which has a chemical structure that closely mimics an ice crystal. There are different methods for getting the seed into the clouds. You can shoot silver flares out of an airplane, or you can use ground-based machines to float the particles into the air like incense. Once the seed particles hit the cloud, the theory is that supercool water droplets will glom onto them, form ice, and then more droplets will attach onto that ice. Before long, they have formed snowflakes heavy enough to fall, and voila – extra precipitation hits the ground below. Vincent “The Snow Man” Schaefer, who worked for General Electric in the 1940s, is widely credited as the father of cloud seeding. He also became the first scientist to create an artificial snowstorm while working at the General Electric Research Laboratory in 1947. To this day, no one has developed a more promising method of seeding clouds than Kurt Vonnegut’s big brother Bernard. In 1946, Bernard Vonnegut worked alongside Vincent Schaefer and Irving Langmuir at General Electric as they were doing their early experiments on cloud seeding. 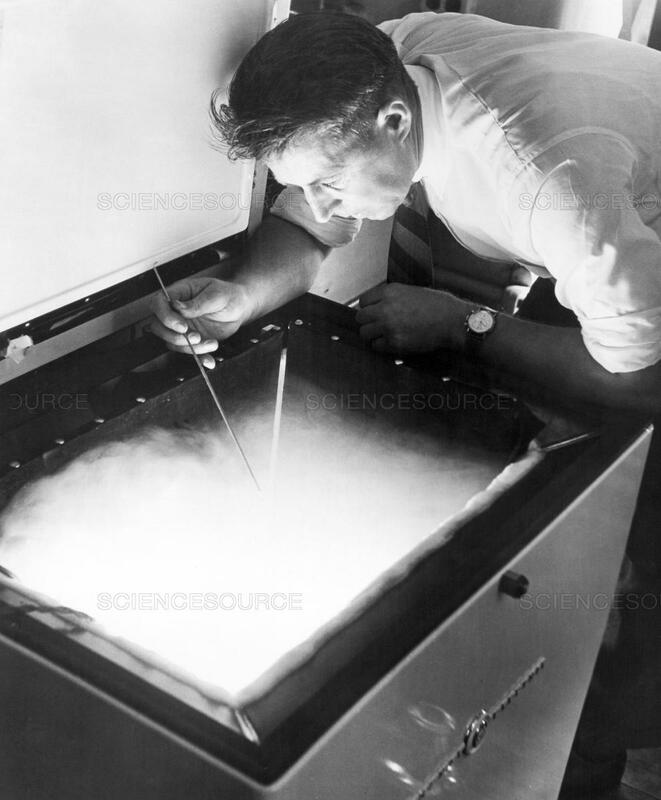 Schaefer discovered that he could seed clouds with dry ice. But Vonnegut realised that he could do it better with silver iodide, which more closely mimics the chemical structure of water ice. Kurt joined his big brother at General Electric a few years later, taking a job as a PR man. Heavily influenced by his brother’s research, Kurt wrote Cat’s Cradle in 1963. The novel’s plot hinges on the invention of “Ice-9” – a seed crystal that could freeze any water it came in contact with, and a weapon of mass destruction that could only be dreamed up by someone whose brother was one of the fathers of cloud seeding. A Wyoming Weather Modification Pilot Programme, a well-designed, decade-long cloud seeding experiment, used two mountain ranges close enough to each other that they were often hit by the same storms. But that also meant they were cross-contaminated. Vincent Schaefer – “Snow Man” who brewed snowstorms in his General Electric lab – was also the seed of a secretive US government programme intended to kill hurricanes through cloud seeding. Thanks to the efforts of him and his research partner, Nobel laureate Irving Langmuir, the American military funded two decades of assassination attempts against major storms. Schaefer and Langmuir had a promising theory. They believed that if they dumped silver iodide into the eye of a hurricane, they could cause the storm to form a new, bigger eyewall. That sounds scary, but it is actually a good thing: A bigger eye means a smaller pressure gradient and less destructive winds. Soon after, the hurricane abruptly changed course and made landfall near Savannah, Georgia. The public blamed the destruction on cloud seeding, lawsuits followed, and Cirrus was cancelled. It took 12 years for the government to officially admit that it had seeded the storm. The US military quietly carried out a few experiments after the Cirrus disaster, but did not officially reboot the programme until 1962. It was rechristened Project Stormfury and experimented on several hurricanes until 1971. Stomfury never produced any conclusive evidence that cloud seeding could weaken a storm, but it did fund extensive meteorological research that helps guide hurricane predictions to this day – and the dream has not fully died. Previous articleThe rains are coming, but will cloud seeding work?